The AgriBusiness Global® Sourcing Network™ is the premier resource for buyers and sellers of crop protection products. The Network is a dedicated business tool for the crop protection market, featuring many product types such as technical-grade and formulated pesticides and biopesticides. Search more than 7,000 products and filter results by formulation or supplier region to find the exact products you need. Search more than 700 suppliers, view company information, and browse their product portfolios. Connect with suppliers around the world on your specific product needs, request quotes or other information. 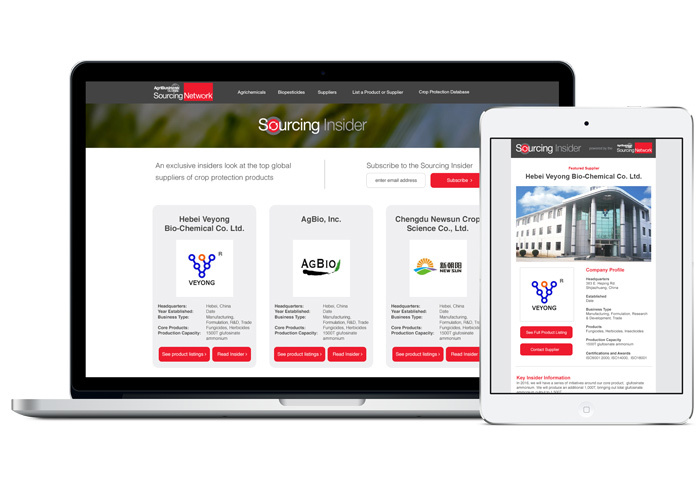 Send a Sourcing Insider™ e-mail featuring exclusively your company and product offerings to over 12,000 agribusiness professionals. Update your company’s profile with Premium Supplier features such as detailed company information, featured product lines, and relevant export capabilities. Keep your product portfolio up to date – list new products and update your product portfolio as often as you like. 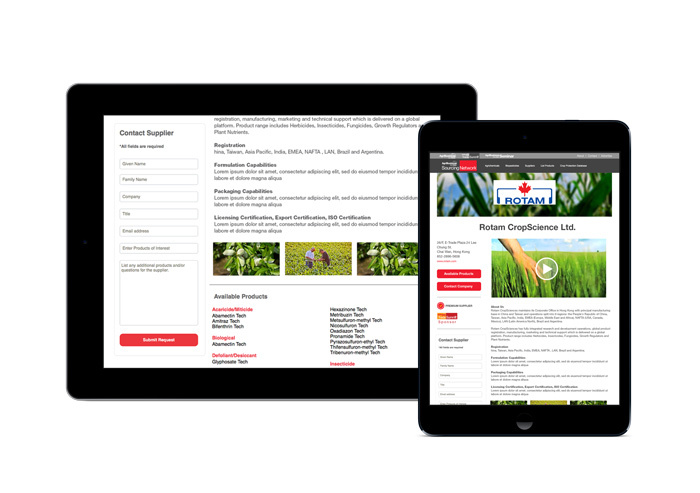 Start using the Sourcing Network today to be part of the most interactive resource for the crop protection industry! Maximize your presence and lead generation capabilities, stand out in the crowd with the Premium Supplier badge! As a Premium Supplier, you earn the Premium Supplier badge on your company profile along with several other upgrades. You can customize your company’s profile with detailed company or product line information, videos and graphics, and/or specific information for buyers such as validation points, registrations, formulation/packaging capabilities, or certifications (e.g., licensing, export, or ISO). Your logo will also appear on the Sourcing Network homepage with a direct link to your company profile. Contact [email protected] to get started. Ask about special discounts for Trade Summit exhibitors. Provide global buyers with the key information they need to start a business relationship today. The quickest, most cost effective way to generate quality leads is here! A custom promotional e-mail, featuring exclusively your company, delivered to 12,000+ agribusiness professionals worldwide. Work with our editors to create your custom message. Promote the latest company news, new business directions, plant expansions, anticipated product launches, increased production capacities, etc. Buyers will click to see your product offerings and request a quote. Promotion of your Sourcing Insider e-mail on the Sourcing Network. Once your e-mail is sent, we post it on the Sourcing Network for all to see, anytime, anywhere. Promotion on the Sourcing Network homepage. Your logo and an excerpt of your promotional e-mail is posted on the Sourcing Network homepage, driving traffic to your product offerings and your full Sourcing Insider e-mail. Have an Idea for the Sourcing Network? We’d like to hear it! The primary mission of the Sourcing Network is to help connect buyers and sellers of crop protection products around the world. We want the Network to be the premier platform for manufacturers, trading companies, and in-country distributors to source products and research companies. New products and suppliers are added to the Network daily and we are continuously looking for ways to make the Network work better for you. Please let us know how we can make the Network a better business tool for you – send us a note today!